I’m Leah, a Chartered transport and street engineering specialist with a keen interest in the public realm and a passion for making great places. I joined Civic Engineers in 2016 from Fore Consulting and have previously worked at Buro Happold in Leeds and Alan Baxter & Associates in London. I have worked extensively in development planning and urban regeneration for both public and private sector clients, and have provided strategic advice on transport and infrastructure solutions to support future growth. I have taken a leading role in the preparation of Transport Assessments, Travel Plans and Design Codes helping secure planning permission for a wide range of projects; from office and residential developments to large mixed-use masterplans and urban areas. My role is to lead Civic Engineers’ transport input on projects across the practice. Outside work I like to bake sourdough bread, go on adventures with my family, and ride my bicycle. 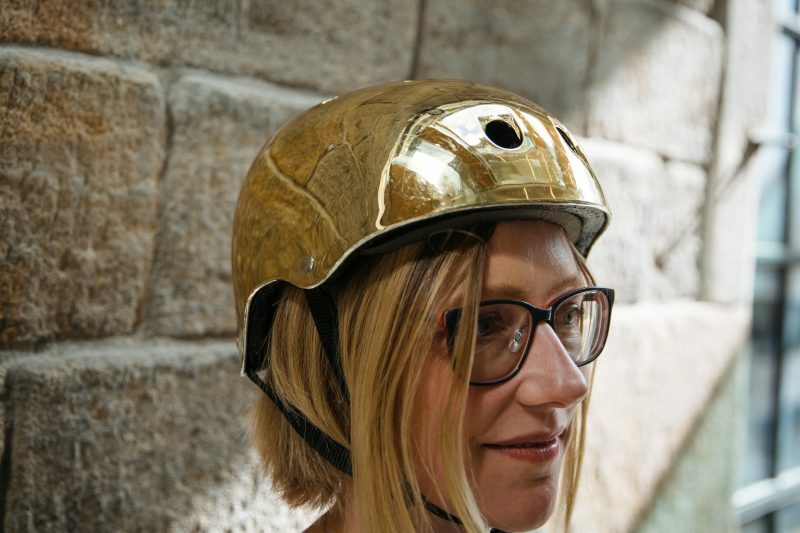 My chosen object is my gold cycle helmet: partly because it acknowledges my enthusiasm for cycling and sustainable transport in general; partly because it’s a glamourous way of protecting my head in a world of boring utilitarian cycle gear, thereby representing a fundamental principle of delivering high quality in terms of form and function; partly because it sparks conversation and leads to interesting interactions on my daily commute; and mostly because it makes me look and feel like a superhero… yes?